Came out pretty mean. Fall off the bone, but not so much so you could still hold the bone to eat them. Only thing I'll do differently next time is trim some fat off because they were pretty fatty when eating. Looks mint. What would it have been like after say, 12 hours in the sous vide? What's the reason for going so long? Most recipes recommended 48hrs but screw that. The bottom one is actually really tasty. My fun take on a pina colada, substituting lemon juice with pineapple juice and coconut cream instead of regular cream. Depends if you want meat or soup I guess. I can send you the base recipe for the cheesecake itself but the pineapple top I winged it. But it's just blended up tinned pineapple with its juice/syrup and like 2 or 3 leaves of gelatin. Surely there's such a thing as terminal tenderness? It can go kinda mushy. I watched a vid on yt of some dude that did 48 hour ribs sous vide. When he pulled them out of the bag they fell apart and the meat was almost paste. I'd say that was terminal, that's nae how you eat ribs. Oh my - these pics are making me hungrY! No wonder you can't reach the bottom of the shopping trolley. 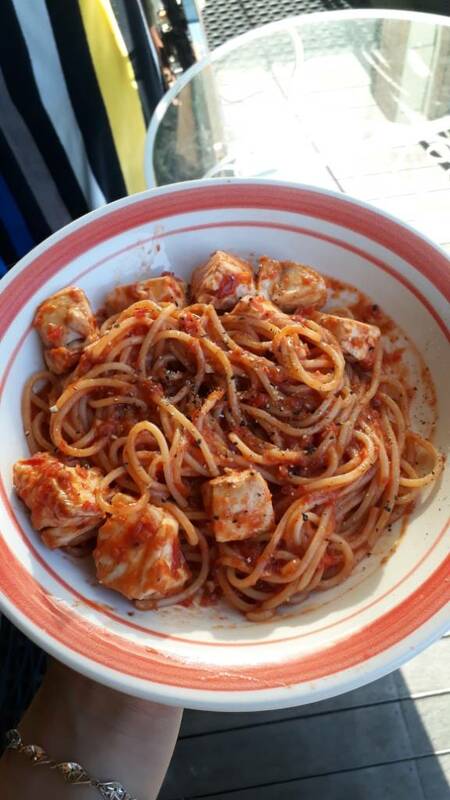 Had some veges in the fridge and tomatoes I grew that needed using up, roasted tomatoes, capsicum, red onion, garlic (also home grown) and blended it into a sort of pasta sauce/tomato paste, it smells really good. Also got about a kg of tomatoes from sunlight which I cooked off to make some chopped tomatoes (like the canned stuff) to freeze and use for things like soup or stuff in the slow cooker. Definitely want to grow more tomatoes next year, there are some awesome varieties out there. Keen for some different varieties of chillies as well. Made some pasta with the sauce and some king fish. Really yum.